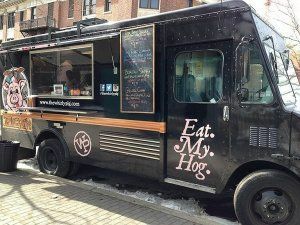 The Whirly Pig is a family owned and operated business that prides itself on using only the finest, fresh, not frozen, ingredients. The Whirly Pig is a family owned and operated business that prides itself on using only the finest, fresh, not frozen, ingredients. When possible we buy locally. Then, with the midas touch from our Executive Chef Zach Whirledge, he whips up the best gourmet pork sandwiches, soups, appetizers and side dishes you'll find anywhere. Being vetted has given us the privilege of vending at the Navy Yard, Porch at 30th Street Station, Love Park, Aiken's Oval, Franklin Park and the rest of the parks in Philadelphia. When not at those locations, we can be seen at Drexel and various corporate centers. On the weekend, we vend at festivals, breweries, wineries, art shows and music festivals. We are proud to introduce our Spoon Foods line of our homemade BBQ Sauce, Catsup, Pickles and Seasoned Salt. They can be purchased off of the truck or at most weekend venues. We also can cater any event. We have catered everything from a formal eight course meal to a three appetizer party. The venue can be served from the truck, buffet style or a sit down dinner. All Chef Zach needs is a head count and a price point to begin getting his creative juices going. Fill out your information on the Contact Us page and someone will be calling you soon.